SYNOPSIS : Pike must protect Larkin Barkley, a spoiled rich girl who is a witness in a major case. But someone is leaking information about their whereabouts, and the killers are getting all too close. So Pike hatches a plan: turn the tables and hunt down the hunters. Enlisting the help of Elvis Cole, Pike uncovers a web of lies and betrayals where even the cops aren't who they seem. But as the body count rises, it is clear that Pike's biggest threat may be the girl herself - an edgy yet intensely vulnerable soul who seems determined to destroy herself. Another man appeared at the edge of the house, snapping out shots as fast as he could. Pike fired, but the man had already taken cover. Pike pushed the girl across the console, jammed the key into the ignition and gunned his Jeep to the corner. He four-wheeled the turn, buried the accelerator, then glanced at the girl. She stared straight ahead, her eyes red and wet. She was crying again. Pike placed his hand on her thigh. She clenched her eyes and kneaded her hands. He made his deep voice soft. "A long time ago, Joe Pike asked for help. Now he must return the favor, no questions asked…"
Larkin Conner Barkley lives in LA , she is young and staggeringly rich and speeds through the city during its loneliest hours in her Aston Martin as if running for her life. Until out of nowhere a car appears, and with it the metal-on-metal explosion of a terrible accident. Dazed, Larkin attempts to help the other victims. And finds herself the sole witness in a secret federal investigation. For maybe the first time in her life, Larkin wants to do the right thing. But by agreeing to cooperate with the authorities, she becomes the target for a relentless team of killers. And when the U.S. Marshals and the finest security money can buy can't protect her, Larkin's wealthy family turns to the one man money can't buy - Joe Pike. Pike lives a world away from the palaces of Beverly Hills. He's an ex-cop, ex-Marine, ex-mercenary who owes a bad man a favor, and that favor is to keep Larkin alive. The one upside of the job is reuniting with Bud Flynn, Pike's LAPD training officer, and a man Pike reveres as a father. The downside is Larkin Barkley, who is the uncontrollable cover girl for self-destruction -- and as deeply alone as Pike. Pike commits himself to protecting the girl, but when they immediately come under fire, he realizes someone is selling them out. In defiance of Bud and the authorities, Pike drops off the grid with the girl and follows his own rules of survival: strike fast, hit hard, hunt down the hunters. With the help of private investigator Elvis Cole, Pike uncovers a web of lies and betrayals, and the stunning revelation that even the cops are not who they seem. Larkin, a lost soul in the city of Los Angels puts her entire trust on Pike, who teaches her the value of life and love. Murder mysteries and detective novels were my bibles. Until I got bored of the predictable plots, and the typical ex-marine/ex-cop hero giving it all up to protect the rich and pretty damsel in distress. After a gap of two years I came back to this particular novel because of the rave reviews I had heard about this author. This is the eleventh book in the 'Elvis Cole' series although the stories are not connected. Its neither disappointing nor thrilling - its predictable. Its not boring but then again its not something that you would desperately want to finish in a single sitting either. 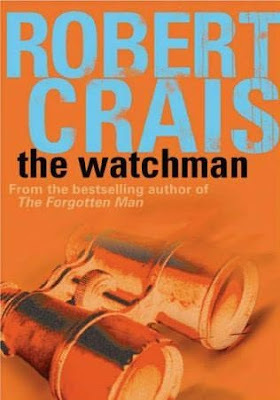 A semi-cop book. looks nice. I might want to read this. I share your thoughts on detective books. Even I have taken to read a bit of drama and other genre for the same reason unless of course any of my fav author comes in sight .. Okay I was checking Robert crais's list of books and both Joe Pike and Elvis Cole were put under the Elvis Cole series. I haven't read any other books of his so am not sure!